SBF - Dart Iron Eagle Heads : ROAD RACERS & CIRCLE BURNER we can upgrade all the valve train for your Application..
Dart's new Iron Eagle heads for small-block Fords are a true bolt-on performance upgrade for the highly popular 289/302/351 family of engines. Made from premium cast iron they are ready to go right out of the box. Intake runners are 180cc and the Exhaust runners are 73cc up from the stock 127cc intake size, and feature streamlined valve guide bosses for improved airflow. The 62cc combustion chambers are reshaped to improve combustion efficiency for increased power. 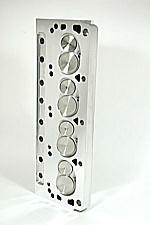 Assembled heads with 1.94"/1.60 valves are available. The Intake Flows 247 @ 500 Lift and the Exhaust Flows 159 @ 500 Lift. Spring Size is 1.437 and Max Lift is 600 Lift for a solid lifer and Hydraulic Roller Cams. Bowl Job - Port & Polish Intake & Exhaust Bowls. You receive Stage 2 and the Cylinder Heads, Fully Ported & Polished Intake & Exhaust. Cylinder Heads, fully Ported and Polished Intake & Exhaust, as well as, Polished Combustion Chambers. Dart's new Iron Eagle heads for small-block Fords are a true bolt-on performance upgrade for the highly popular 289/302/351 family of engines. Made from premium cast iron they are ready to go right out of the box. Intake runners are 180cc and the Exhaust runners are 73cc up from the stock 127cc intake size, and feature streamlined valve guide bosses for improved airflow. The 58cc combustion chambers are reshaped to improve combustion efficiency for increased power. Assembled heads with 1.94.02"/1.60 valves are available. The Intake Flows 247 @ 500 Lift and the Exhaust Flows 159 @ 500 Lift. Spring Size is 1.437 and Max Lift is 600 Lift for a solid lifer and Hydraulic Roller Cams. Bowl Job -Port & Polish Intake & Exhaust Bowls. Cylinder Heads, match ported Intake and Exhaust and polished 1-2" inches in Ports and Port & Polish Intake & Exhaust Bowls. Dart's new Iron Eagle heads for small-block Fords are a true bolt-on performance upgrade for the highly popular 289/302/351 family of engines. Made from premium cast iron they are ready to go right out of the box. Intake runners are 180cc and the Exhaust runners are 73cc up from the stock 127cc intake size, and feature streamlined valve guide bosses for improved airflow. The 62cc combustion chambers are reshaped to improve combustion efficiency for increased power. Assembled heads with 2.02"/1.60 valves are available. The Intake Flows 247 @ 500 Lift and the Exhaust Flows 159 @ 500 Lift. Spring Size is 1.437 and Max Lift is 600 Lift for a solid lifer and Hydraulic Roller Cams. Dart's new Iron Eagle heads for small-block Fords are a true bolt-on performance upgrade for the highly popular 289/302/351 family of engines. Made from premium cast iron they are ready to go right out of the box. Intake runners are 180cc and the Exhaust runners are 73cc up from the stock 127cc intake size, and feature streamlined valve guide bosses for improved airflow. The 58cc combustion chambers are reshaped to improve combustion efficiency for increased power. Assembled heads with 2.02"/1.60 valves are available. The Intake Flows 247 @ 500 Lift and the Exhaust Flows 159 @ 500 Lift. Spring Size is 1.437 and Max Lift is 600 Lift for a solid lifer and Hydraulic Roller Cams. 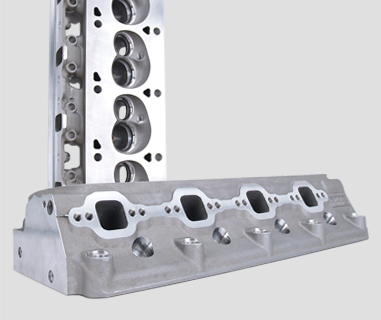 Dart's Ford Pro 1 Cylinder Heads are cast from the same virgin C355-T61 aircraft alloy that is used in Dart Pro-Stock heads. These Windsor style heads have been completely redesigned to offer the performance advantage of ported style heads without the expense. Dart's PRO1 ports and chambers are designed to emulate ported shapes in an as-cast configuration. Standard valve angle and spacing is retained for bolt-on compatability. Manganese bronze valve guides are used for long life, and hardened valve seats provide durability with unleaded fuels. Whether youre building a mild street engine or a big inch fire breather, Dart heads will give you a performance advantage! The Intake Flows 288 CFM's @ 700 Lift and the Exhaust Flows 185 CFM's @ 600 Lift stock form. 195CC Intake Runner with a 65CC Exhuast Port Runner. 2.02 Intake Valve and a 1.60 Exhaust Valve. It has 65CC Combustion Chamber. It comes with 1.437 Spring with max lift of 600 Solid Lifter and Hydraulic Roller Cams. Dart's Ford Pro 1 Cylinder Heads are cast from the same virgin C355-T61 aircraft alloy that is used in Dart Pro-Stock heads. These Windsor style heads have been completely redesigned to offer the performance advantage of ported style heads without the expense. Dart's PRO1 ports and chambers are designed to emulate ported shapes in an as-cast configuration. Standard valve angle and spacing is retained for bolt-on compatability. Manganese bronze valve guides are used for long life, and hardened valve seats provide durability with unleaded fuels. Whether youre building a mild street engine or a big inch fire breather, Dart heads will give you a performance advantage! The Intake Flows 288 CFM's @ 700 Lift and the exhaust Flows 185 CFM's @ 700 Lift stock form. 195CC Intake Runner with a 65CC Exhuast Port Runner. 2.02 Intake Valve and a 1.60 Exhaust Valve. It has 65CC Combustion Chamber. It comes with 1.437 Spring with max lift of 600 Solid Lifter and Roller Cams. Dart's Ford Pro 1 Cylinder Heads are cast from the same virgin C355-T61 aircraft alloy that is used in Dart Pro-Stock heads. These Windsor style heads have been completely redesigned to offer the performance advantage of ported style heads without the expense. Dart's PRO1 ports and chambers are designed to emulate ported shapes in an as-cast configuration. Standard valve angle and spacing is retained for bolt-on compatability. Manganese bronze valve guides are used for long life, and hardened valve seats provide durability with unleaded fuels. Whether youre building a mild street engine or a big inch fire breather, Dart heads will give you a performance advantage! The Intake Flows 261 CFM's @ 600 Lift and the exhaust Flows 172 CFM's @ 600 Lift stock form. 170CC Intake Runner with a 65CC Exhuast Port Runner. 1.94 Intake Valve and a 1.60 Exhaust Valve. It has 65CC Combustion Chamber. It comes with 1.437 Spring with max lift of 600 Solid Lifter and Hydraulic Roller Cams. 20 Degree Aluminum Heads 58 CC Combustion Chambers, Max Lift .560 Pro Action Aluminum 200 CC Cylinder Heads, 58CC Combustion Chambers with Angle Plugs and 2.02 intake valve and 1.600 exhaust valve. These heads are set up for a Hydraulic Flat Tappet Cam for a max lift of .560. The intake on these heads flow 286 and 202 on Exhast. These heads are some of the best castings I have ever seen! I believe that Race Head Services 20 degree angle heads, which is a factory angle valve, are the best heads on the market that I have seen! I also believe that RHS makes some of the best 20 degree Heads out there. The Small Block Windsor and 5.0-liter engines are two of the most popular engine designs in the history of Ford technology. And now, RHS® has developed an impressive head series to provide Small Block Ford engines with increased airflow and horsepower. RHS® Pro Action Small Block Ford Cylinder Heads include more standard features than any Ford head in the industry, including premium bronze valve guides for extended valve sealing and durability. With a host of runner and chamber sizes to meet various performance needs, these heads are truly the race winner's choice.Pro Action Aluminum Cylinder HeadsThe Small Block Windsor and 5.0-liter engines are two of the most popular engine designs in the history of Ford technology. And now, RHS® has developed an impressive head series to provide Small Block Ford engines with increased airflow and horsepower. RHS® Pro Action¿ Small Block Ford Cylinder Heads include more standard features than any Ford head in the industry, including premium bronze valve guides for extended valve sealing and durability. With a host of runner and chamber sizes to meet various performance needs, these heads are truly the race winner's choice. If you cannot find the lift that you are looking for email me at ronny.68@live.com or call (256-347-8453) and we can find the lift and price for you!! Pro Action Aluminum 200 CC Cylinder Heads, 58CC Combustion Chambers with Angle Plugs and 2.02 intake valve and 1.600 exhaust valve. These heads are set up for a Hydraulic Roller Cam for a max lift of .600. The intake on these heads flow 286 and 202 on Exhast. These heads are some of the best castings I have ever seen! I believe that Race Head Services 20 degree angle heads, which is a factory angle valve, are the best heads on the market that I have seen! I also believe that RHS makes some of the best 20 degree Heads out there. The Small Block Windsor and 5.0-liter engines are two of the most popular engine designs in the history of Ford technology. And now, RHS® has developed an impressive head series to provide Small Block Ford engines with increased airflow and horsepower. RHS® Pro Action¿ Small Block Ford Cylinder Heads include more standard features than any Ford head in the industry, including premium bronze valve guides for extended valve sealing and durability. With a host of runner and chamber sizes to meet various performance needs, these heads are truly the race winner's choice.Pro Action Aluminum Cylinder HeadsThe Small Block Windsor and 5.0-liter engines are two of the most popular engine designs in the history of Ford technology. And now, RHS® has developed an impressive head series to provide Small Block Ford engines with increased airflow and horsepower. RHS® Pro Action Small Block Ford Cylinder Heads include more standard features than any Ford head in the industry, including premium bronze valve guides for extended valve sealing and durability. With a host of runner and chamber sizes to meet various performance needs, these heads are truly the race winner's choice. If you cannot find the lift that you are looking for email me at ronny.68@live.com or call (256-347-8453) and we can find the lift and price for you!! Pro Action Aluminum 200 CC Cylinder Heads, 65CC Combustion Chambers with Angle Plugs and 2.02 intake valve and 1.600 exhaust valve. These heads are set up for a Hydraulic Flat Tappet Cam for a max lift of .560. The intake on these heads flow 286 and 202 on Exhast. These heads are some of the best castings I have ever seen! I believe that Race Head Services 20 degree angle heads, which is a factory angle valve, are the best heads on the market that I have seen! I also believe that RHS makes some of the best 20 degree Heads out there. The Small Block Windsor and 5.0-liter engines are two of the most popular engine designs in the history of Ford technology. And now, RHS® has developed an impressive head series to provide Small Block Ford engines with increased airflow and horsepower. RHS® Pro Action¿ Small Block Ford Cylinder Heads include more standard features than any Ford head in the industry, including premium bronze valve guides for extended valve sealing and durability. With a host of runner and chamber sizes to meet various performance needs, these heads are truly the race winner's choice.Pro Action Aluminum Cylinder HeadsThe Small Block Windsor and 5.0-liter engines are two of the most popular engine designs in the history of Ford technology. And now, RHS® has developed an impressive head series to provide Small Block Ford engines with increased airflow and horsepower. RHS® Pro Action¿ Small Block Ford Cylinder Heads include more standard features than any Ford head in the industry, including premium bronze valve guides for extended valve sealing and durability. With a host of runner and chamber sizes to meet various performance needs, these heads are truly the race winner's choice. If you cannot find the lift that you are looking for email me at ronny.68@live.com or call (256-347-8453) and we can find the lift and price for you!! Pro Action Aluminum 200 CC Cylinder Heads, 64CC Combustion Chambers 600 Max lift with Angle Plugs and 2.02 intake valve and 1.600 exhaust valve. These heads are set up for a Hydraulic Roller Cam for a max lift of .600. The intake on these heads flow 286 and 202 on Exhast. These heads are some of the best castings I have ever seen! I believe that Race Head Services 20 degree angle heads, which is a factory angle valve, are the best heads on the market that I have seen! Pro Action Aluminum 200 CC Cylinder Heads, 64CC Combustion Chambers with Angle Plugs and 2.02 intake valve and 1.600 exhaust valve. These heads are set up for a Hydraulic Roller Cam for a max lift of .600. The intake on these heads flow 286 and 202 on Exhast. These heads are some of the best castings I have ever seen! I believe that Race Head Services 20 degree angle heads, which is a factory angle valve, are the best heads on the market that I have seen! I also believe that RHS makes some of the best 20 degree Heads out there. The Small Block Windsor and 5.0-liter engines are two of the most popular engine designs in the history of Ford technology. And now, RHS® has developed an impressive head series to provide Small Block Ford engines with increased airflow and horsepower. RHS® Pro Action¿ Small Block Ford Cylinder Heads include more standard features than any Ford head in the industry, including premium bronze valve guides for extended valve sealing and durability. With a host of runner and chamber sizes to meet various performance needs, these heads are truly the race winner's choice.Pro Action Aluminum Cylinder HeadsThe Small Block Windsor and 5.0-liter engines are two of the most popular engine designs in the history of Ford technology. And now, RHS® has developed an impressive head series to provide Small Block Ford engines with increased airflow and horsepower. RHS® Pro Action Small Block Ford Cylinder Heads include more standard features than any Ford head in the industry, including premium bronze valve guides for extended valve sealing and durability. With a host of runner and chamber sizes to meet various performance needs, these heads are truly the race winner's choice. If you cannot find the lift that you are looking for email me at ronny.68@live.com or call (256-347-8453) and we can find the lift and price for you!! The Small Block Windsor and 5.0-liter engines are two of the most popular engine designs in the history of Ford technology. And now, RHS® has developed an impressive head series to provide Small Block Ford engines with increased airflow and horsepower. RHS® Pro Action¿ Small Block Ford Cylinder Heads include more standard features than any Ford head in the industry, including premium bronze valve guides for extended valve sealing and durability. With a host of runner and chamber sizes to meet various performance needs, these heads are truly the race winner's choice.Pro Action Aluminum Cylinder HeadsThe Small Block Windsor and 5.0-liter engines are two of the most popular engine designs in the history of Ford technology. And now, RHS® has developed an impressive head series to provide Small Block Ford engines with increased airflow and horsepower. RHS® Pro Action¿ Small Block Ford Cylinder Heads include more standard features than any Ford head in the industry, including premium bronze valve guides for extended valve sealing and durability. With a host of runner and chamber sizes to meet various performance needs, these heads are truly the race winner's choice. Pro Action Aluminum 215 CC Cylinder Heads, 58CC Combustion Chambers 560 Max Lift with Angle Plugs and 2.08 intake valve and 1.600 exhaust valve. These heads are set up for a Hydraulic Flat Tappet Cam for a max lift of .560. The intake on these heads flow 314 and 202 on Exhast. These heads are some of the best castings I have ever seen! I believe that Race Head Services 20 degree angle heads, which is a factory angle valve, are the best heads on the market that I have seen! Also, I Believe RHS sells some of the best 20 degree heads out there. The Small Block Windsor and 5.0-liter engines are two of the most popular engine designs in the history of Ford technology. And now, RHS® has developed an impressive head series to provide Small Block Ford engines with increased airflow and horsepower. RHS® Pro Action¿ Small Block Ford Cylinder Heads include more standard features than any Ford head in the industry, including premium bronze valve guides for extended valve sealing and durability. With a host of runner and chamber sizes to meet various performance needs, these heads are truly the race winner's choice.Pro Action Aluminum Cylinder HeadsThe Small Block Windsor and 5.0-liter engines are two of the most popular engine designs in the history of Ford technology. And now, RHS® has developed an impressive head series to provide Small Block Ford engines with increased airflow and horsepower. RHS® Pro Action¿ Small Block Ford Cylinder Heads include more standard features than any Ford head in the industry, including premium bronze valve guides for extended valve sealing and durability. With a host of runner and chamber sizes to meet various performance needs, these heads are truly the race winner's choice. If you cannot find the lift that you are looking for email me at ronny.68@live.com or call (256-347-8453) and we can find the lift and price for you!! Pro Action Aluminum 215 CC Cylinder Heads, 58CC Combustion Chambers .600 Max Lift with Angle Plugs and 2.08 intake valve and 1.600 exhaust valve. These heads are set up for a Hydraulic Roller Cam for a max lift of .600. The intake on these heads flow 314 and 202 on Exhast. These heads are some of the best castings I have ever seen! I believe that Race Head Services 20 degree angle heads, which is a factory angle valve, are the best heads on the market that I have seen! I also believe that RHS makes some of the best 20 degree Heads out there. The Small Block Windsor and 5.0-liter engines are two of the most popular engine designs in the history of Ford technology. And now, RHS® has developed an impressive head series to provide Small Block Ford engines with increased airflow and horsepower. RHS® Pro Action¿ Small Block Ford Cylinder Heads include more standard features than any Ford head in the industry, including premium bronze valve guides for extended valve sealing and durability. With a host of runner and chamber sizes to meet various performance needs, these heads are truly the race winner's choice.Pro Action Aluminum Cylinder HeadsThe Small Block Windsor and 5.0-liter engines are two of the most popular engine designs in the history of Ford technology. And now, RHS® has developed an impressive head series to provide Small Block Ford engines with increased airflow and horsepower. RHS® Pro Action¿ Small Block Ford Cylinder Heads include more standard features than any Ford head in the industry, including premium bronze valve guides for extended valve sealing and durability. With a host of runner and chamber sizes to meet various performance needs, these heads are truly the race winner's choice. If you cannot find the lift that you are looking for email me at ronny.68@live.com or call (256-347-8453) and we can find the lift and price for you!! Ported & Polsihed SBF Racing Head Services Pro Action 215CC Aluminum Cylinder Heads 64CC Combustion Chambers .560 max lift with Angle Plugs and 2.08 intake valve and 1.600 exhaust valve. These heads are set up for a Hydraulic Flat Tappet Cam for a max lift of .560. The intake on these heads flow 314 and 202 on Exhast. These heads are some of the best castings I have ever seen! I believe that Race Head Services 20 degree angle heads, which is a factory angle valve, are the best heads on the market that I have seen! I also believe that RHS makes some of the best 20 degree Heads out there. The Small Block Windsor and 5.0-liter engines are two of the most popular engine designs in the history of Ford technology. And now, RHS® has developed an impressive head series to provide Small Block Ford engines with increased airflow and horsepower. RHS® Pro Action Small Block Ford Cylinder Heads include more standard features than any Ford head in the industry, including premium bronze valve guides for extended valve sealing and durability. With a host of runner and chamber sizes to meet various performance needs, these heads are truly the race winner's choice.Pro Action Aluminum Cylinder HeadsThe Small Block Windsor and 5.0-liter engines are two of the most popular engine designs in the history of Ford technology. And now, RHS® has developed an impressive head series to provide Small Block Ford engines with increased airflow and horsepower. RHS® Pro Action¿ Small Block Ford Cylinder Heads include more standard features than any Ford head in the industry, including premium bronze valve guides for extended valve sealing and durability. With a host of runner and chamber sizes to meet various performance needs, these heads are truly the race winner's choice. Ported & Polsihed SBF Racing Head Services Pro Action 215CC ALuminum Cylinder Heads 64CC Combustion Chambers .600 max lift with Angle Plugs and 2.08 intake valve and 1.600 exhaust valve. These heads are set up for a Hydraulic Roller Cam for a max lift of .600. The intake on these heads flow 314 and 202 on Exhast. These heads are some of the best castings I have ever seen! I believe that Race Head Services 20 degree angle heads, which is a factory angle valve, are the best heads on the market that I have seen! I also believe that RHS makes some of the best 20 degree Heads out there. The Small Block Windsor and 5.0-liter engines are two of the most popular engine designs in the history of Ford technology. And now, RHS® has developed an impressive head series to provide Small Block Ford engines with increased airflow and horsepower. RHS® Pro Action Small Block Ford Cylinder Heads include more standard features than any Ford head in the industry, including premium bronze valve guides for extended valve sealing and durability. With a host of runner and chamber sizes to meet various performance needs, these heads are truly the race winner's choice.Pro Action Aluminum Cylinder HeadsThe Small Block Windsor and 5.0-liter engines are two of the most popular engine designs in the history of Ford technology. And now, RHS® has developed an impressive head series to provide Small Block Ford engines with increased airflow and horsepower. RHS® Pro Action¿ Small Block Ford Cylinder Heads include more standard features than any Ford head in the industry, including premium bronze valve guides for extended valve sealing and durability. With a host of runner and chamber sizes to meet various performance needs, these heads are truly the race winner's choice. The 58 combustion chamber is sized for true bolt on compatibility, and has been tweaked to optimize efficiency. World¿s Windsor-series cast iron cylinder heads provide a very cost-effective solution to getting serious power from a Ford 5.0 motor without spending a ton of money. They come with 1.94 Intake valve and 1.60 Exhaust valve and they are set up for a flat tappet hydrualic cam. When it comes to value, you can't beat the assembly packages from World. Top grade components, like Manley stainless steel valves, are used as your assurance of reliability, with World passing bulk buying advantages right through to customers. They are 50-state emissions legal. The Windsor series of cylinder heads come in 180cc (Jr.) models that combine high velocity and superior flow. They produce excellent torque and throttle response in 5.0 engines. The Jr. is better suited to stock or slightly modified engines. The Windsor series of cylinder heads come in 180cc (Jr.) model that comes with combined high velocity and superior flow. They produce excellent torque and throttle response in 5.0 engines. The Jr. is better suited to stock or slightly modified engines and the larger . Stage1 - Bowl Job -Port & Polish Intake & Exhaust Bowls. Stage 2 - Cylinder Heads, match ported Intake and Exhaust and polished 1-2" inches in Ports and Port & Polish Intake & Exhaust Bowls. Stage 3 - You receive Stage 2 and the Cylinder Heads, Fully Ported & Polished Intake & Exhaust. Stage 4 - Cylinder Heads, fully Ported and Polished Intake & Exhaust, as well as, Polished Combustion Chambers. Stage 5 - Cylinder Heads, Fully Ported & Polished Intake & Exhaust, Unshroud Combustion Chambers around Intake and Exhaust Valve and Polish Combustion Chamber, and then we CC all Combustion Chambers for equal Combustion Chamber Volume. The 58 combustion chamber is sized for true bolt on compatibility, and has been tweaked to optimize efficiency. Worlds Windsor-series cast iron cylinder heads provide a very cost-effective solution to getting serious power from a Ford 5.0 motor without spending a ton of money. They come with 1.94 Intake valve and 1.60 Exhaust valve and they are set up for a flat tappet hydraulic cam. When it comes to value, you can't beat the assembly packages from World. Top grade components, like Manley stainless steel valves, are used as your assurance of reliability, with World passing bulk buying advantages right through to customers. They are 50-state emissions legal. The Windsor series of cylinder heads come in 180cc (Jr.) models that combine high velocity and superior flow. They produce excellent torque and throttle response in 5.0 engines. The Jr. is better suited to stock or slightly modified engines. The Windsor series of cylinder heads come in 180cc (Jr.) model that comes with combined high velocity and superior flow. They produce excellent torque and throttle response in 5.0 engines. The Jr. is better suited to stock or slightly modified engines and the larger. Stage1 - Bowl Job -Port & Polish Intake & Exhaust Bowls. Stage 2 - Cylinder Heads, match ported Intake and Exhaust and polished 1-2" inches in Ports and Port & Polish Intake & Exhaust Bowls. Stage 3 - You receive Stage 2 and the Cylinder Heads, Fully Ported & Polished Intake & Exhaust. Stage 4 - Cylinder Heads, fully Ported and Polished Intake & Exhaust, as well as, Polished Combustion Chambers. Stage 5 - Cylinder Heads, Fully Ported & Polished Intake & Exhaust, Unshroud Combustion Chambers around Intake and Exhaust Valve and Polish Combustion Chamber, and then we CC all Combustion Chambers for equal Combustion Chamber Volume. When it comes to high performance replacements for factory cast iron heads, World's WINDSOR SR. boasting 200cc ports, plus 64cc exhausts ports that are substantially larger than OEM Ford heads. Add a highly efficient combustion chamber design and larger valves and you have big bolt-on power. These heads are also 50-State emissions legal factory replacements. These heads carry a 2.02 exhaust valve and a 1.600 exhaust valve, with a Max Lift up to .560 Hydraulic Cam. A Factory Ford head carries a 127CC Intake runner, hands down, these heads are much more Superior than the factory casting heads!! When it comes to high performance replacements for factory cast iron heads, World's WINDSOR SR. boasting 200cc ports, plus 64cc exhausts ports that are substantially larger than OEM Ford heads. Add a highly efficient combustion chamber design and larger valves and you have big bolt-on power. These heads are also 50-State emissions legal factory replacements. These heads carry a 2.02 exhaust valve and a 1.600 exhaust valve, with a Max Lift up to .600 Solid Hydraulic Roller Cam. A Factory Ford head carries a 127CC Intake runner, hands down, these heads are much more Superior than the factory casting heads! !